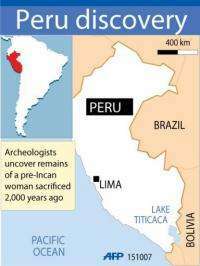 A joint Japanese-Peruvian archeological mission has uncovered the remains of a pre-Incan woman sacrificed more than 2,000 years ago in the Andean nation, experts told local media. A joint Japanese-Peruvian archeological mission has uncovered the remains of a pre-Incan woman sacrificed more than 2,000 years ago in the Andean nation, experts told local media Wednesday. "The bones were discovered in a fetal position, with the legs bound by a cord that has been preserved despite the passage of the centuries," Japanese researcher Yuji Seki told the El Comercio daily. The remains were uncovered at an archeological complex in northern Peru's Cajamarca department, where several previous discoveries of ancient remains have been made. Baptized the "Lady of Pacopampa" after the site in the northern highlands where she was found, she was 1.55 meters (five feet one inch) tall, and was surrounded in her tomb with several gold artifacts including pendants, necklaces and plates, according to the researchers. Seki said the woman was between 30 and 40 years old and lived 800 to 900 years before Christ, which would make the Lady of Pacopampa considerably older than most excavated or mummified bodies found in Peru. The remains of the woman were discovered one week ago in Pacopampa, in Chota province of Cajamarca, some 850 kilometers (530 miles) northeast of the capital Lima. A previous study from Pacopampa noted that several remains discovered at the important Andean ceremonial site date from the Formative Period between 2500 BC and 0 AD. The latest field work was part of a joint mission between archeologists at Japan's National Museum of Ethnology and Peru's University of San Marcos. Very confused dates in the article.